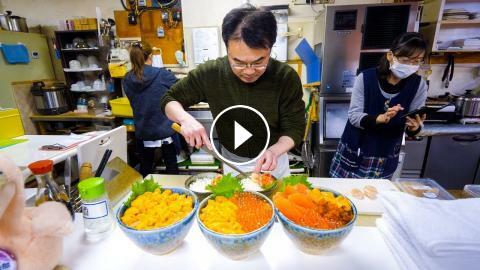 ﻿ Unbelievable SEA URCHIN (Uni) Rice Bowl - JAPANESE FOOD in Otaru, Hokkaido, Japan! Japanese food - Uni (sea urchin) day trip to Otaru, Hokkaido, Japan! Otaru is a small port town on the island of Hokkaido in Japan, that’s known for its abundance of delicious and fresh seafood. So during my trip to Sapporo, I knew it was one day trip we didn’t want to miss. Sapporo Station - To get to Otaru from Sapporo, you can take the JR train from Sapporo Station. It cost me 640 JPY ($5.73) and the ride took about 45 minutes or so. Just outside the Otaru train station and to the left hand side as you exit, you’ll find Sankaku Market, a small and very friendly fresh seafood market selling an abundance of Hokkaido seafood delicacies like uni (sea urchin). There are some very famous seafood rice bowl restaurants, but you’ll also find different fish, and fresh King crabs and hairy crabs. I took one walk through the seafood market, but then settled on the first shop - mainly because they owners were so friendly and welcoming. Kawashima Shop - This the the seafood shop at the market we ate lunch at, and I would highly recommend it. The owners and staff were all very friendly, and the seafood was fresh and incredible. Hakkaku (sailfin poacher fish) - 1,000 JPY ($8.96) - Along with uni, one of the things I wanted to eat in Otaru was Hakkaku, which is a sailfin poacher fish. It’s look very unique, and it prepared as sashimi. It was delicious. Uni don (sea urchin bowl) - 4,500 JPY ($40.31) - But the real dish I came all the way to Otaru to eat was a full uni don, sea urchin rice bowl. First a layer of rice went down, then a couple of shiso leaves, then a full bed, and entire box of fresh vibrantly yellow sea urchin (uni). It was outstanding. I’ve had sea urchin many times before, but usually it’s just a couple pieces of sushi, this was an entire bowl full, and it was insanely delicious. Hairy crab (horsehair crab) - 6,500 JPY ($58.23) - Finally, just because I had never had a hairy or horsehair crab, I decided to get a fresh crab. Horsehair crabs are all about the roe inside, and it’s complex and flavorful. This was an amazing day of Japanese food in Otaru, the highlight for me was the seafood market, and it’s well worth a visit when you are in Hokkaido. Japanese Street Food - GIANT OYSTER and Seafood Tour of Tsukiji Market in Tokyo, Japan! UNBELIEVABLE Mexican Food - SIZZLING MEAT + Cenote and Chichen Itza | Yucatán, Mexico!